The Mathematical Association of America (MAA) has sought to improve education in collegiate mathematics. 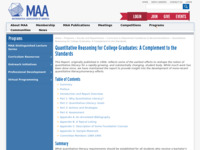 This report outlines standards set forth by the MAA to improve college mathematics education. The report is visionary in that it does not represent a distillation of current national practice in supplying college students with mathematical training. Rather it sets a standard for a quantitatively literate college graduate and suggests reasonable means for the achievement of that standard. The report makes four major points: (1) Colleges and universities should treat quantitative literacy as a thoroughly legitimate and even necessary goal for baccalaureate graduates. (2) Colleges and universities should expect every college graduate to be able to apply simple mathematical methods to the solution of real world problems. (3) Colleges and universities should devise and establish quantitative literacy programs each consisting of a foundation experience and continuation experiences and mathematics departments should provide leadership in the development of such programs. (4) Colleges and universities should accept responsibility for overseeing their quantitative literacy programs through regular assessments. Users can access all chapters of the book as well as all appendices and committee member information.